We always try to take the minis out on an adventure. But, since we’ve been very busy lately, we haven’t had the chance to really go out and have some family fun. 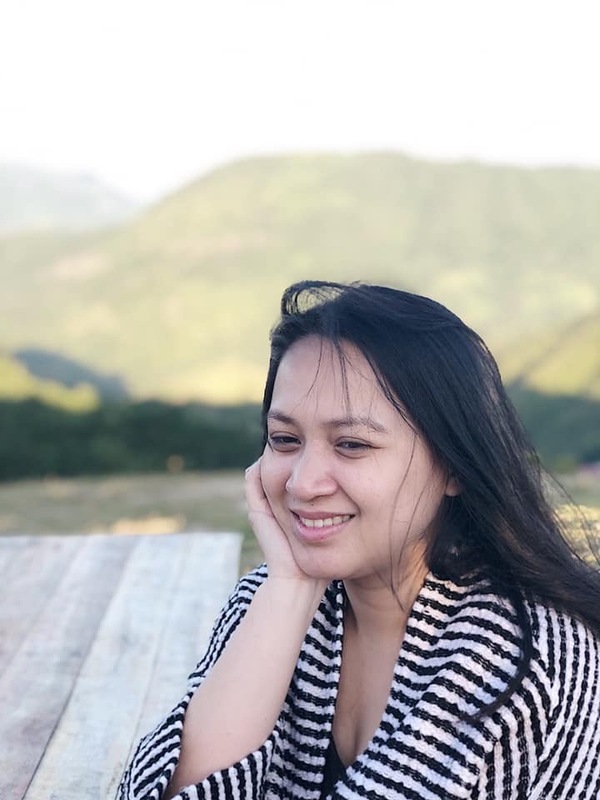 Weekends are spent mostly at home, resting, getting ready for the following week’s work. Thankfully, we got ourselves a long weekend last December 8th to 10th because of the Feast of the Immaculate Conception. 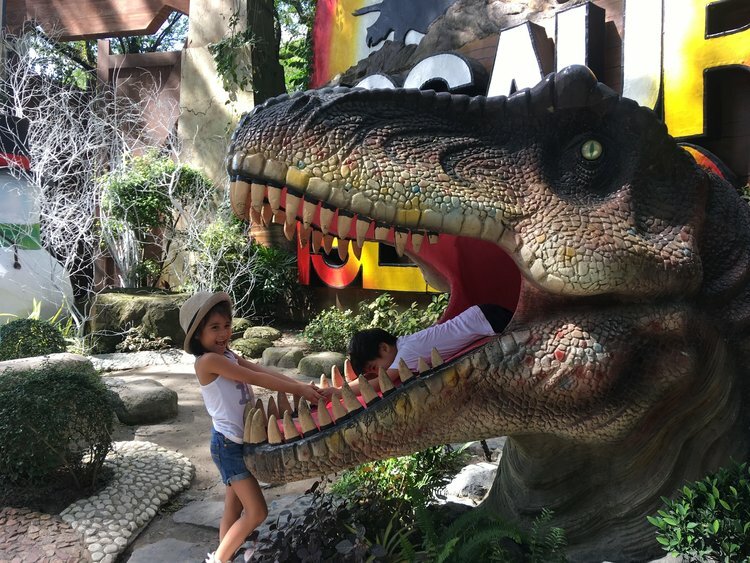 We took Friday off, then brought the minis to Dinosaurs Island Clark, Pampanga the next day. Our boy, who has a fascination for dinosaurs, has been asking us to bring them there for the longest time and so off we went! 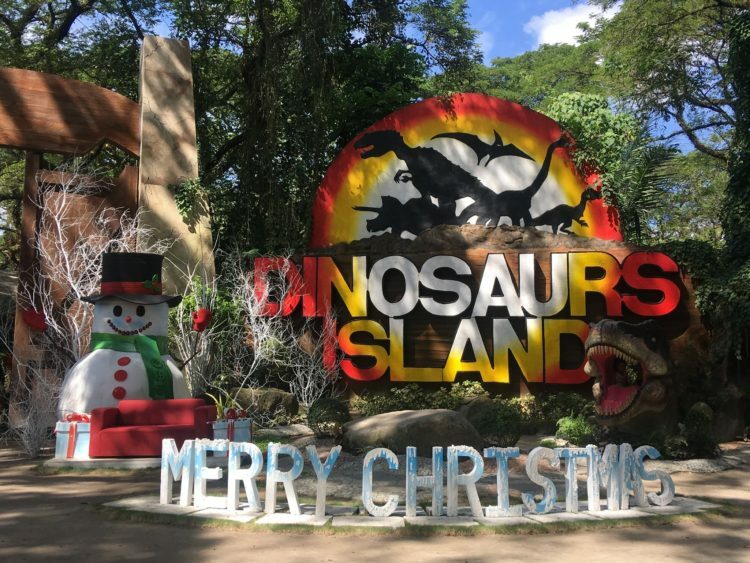 Aside from the Dino Trail, there are other things you can also do in Dinosaurs Island. For instance, there’s the Jurassic Jungle Safari wherein you can experience being chased by dinosaurs. There’s also the 7D and Fossil Museum. For the little ones, they have the Dino Ride. For those who love taking pictures, they have the Wonders of the World. We only tried the Dino Trail, Jurassic Jungle Safari, 7D, and Dino Ride though since we had limited time. If you’re there earlier, you’ll have enough time to check out all the attractions. You’ll most likely finish roaming the park in two hours so you can either head to Insectlandia after exploring Dinosaurs Island, which is just a quick walk from the Dino Park, or you can hang out at the Clark Picnic Grounds, which is what we did since the minis love running around like free range chickens. 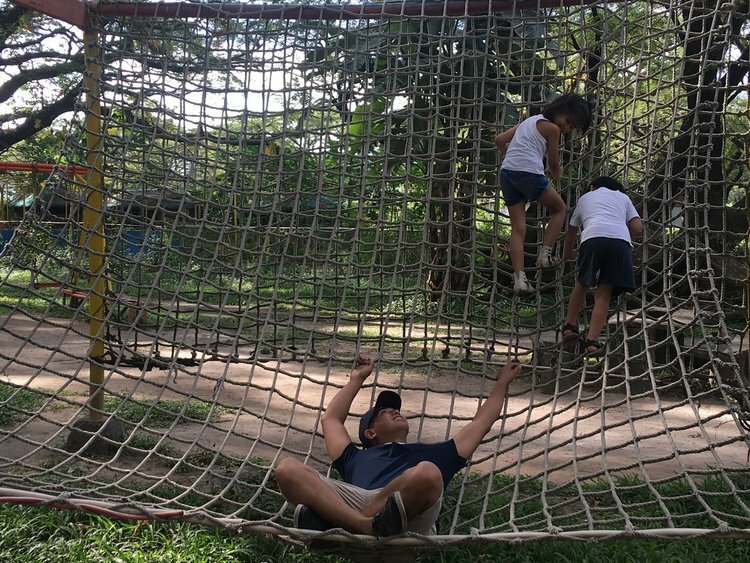 😀 You can rent a hut there where you can have lunch or rest while the kids play around the picnic grounds. We can tell the minis really enjoyed our stay at the picnic grounds. It’s huge so there’s a lot of space for them to run and play. There is also a playground inside, a bike trail, and zip lines. Unfortunately, the zip lines are only for kids 8 years old and above so the minis weren’t able to try them. 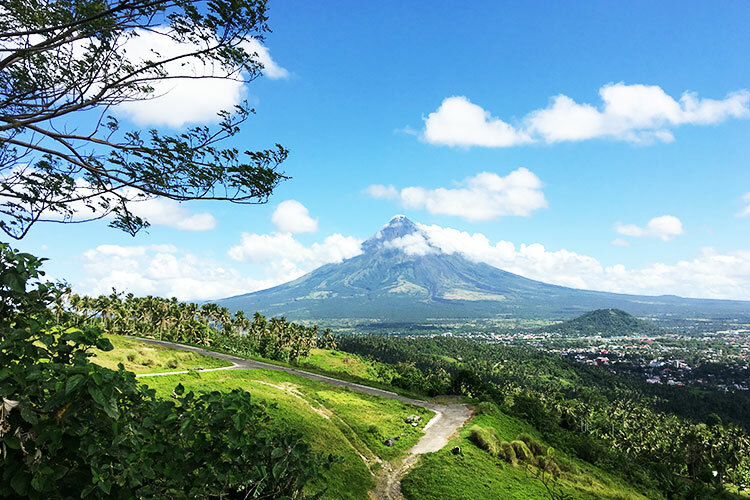 If you have the whole weekend to spare, visit other attractions within the area, such as Nayong Pilipino, Zoocobia, Paradise Ranch, Fontana Water Park, El Kabayo, and Clark Museum. Subic is also nearby already so might as well drop by Ocean Adventure, Zoobic Safari, and JEST Camp. Note: The rates displayed here are as of 9th December 2017. These may change over time. It is best to check the Dinosaurs Island Clark website for updated rates. This fee includes a guided tour around the Dino Trail where you will see moving dinosaurs. Each display has a trivia, which is a good opportunity for you to teach your little one about the different dinosaurs. At the end of the trail, you will get to watch an entertaining dino show. 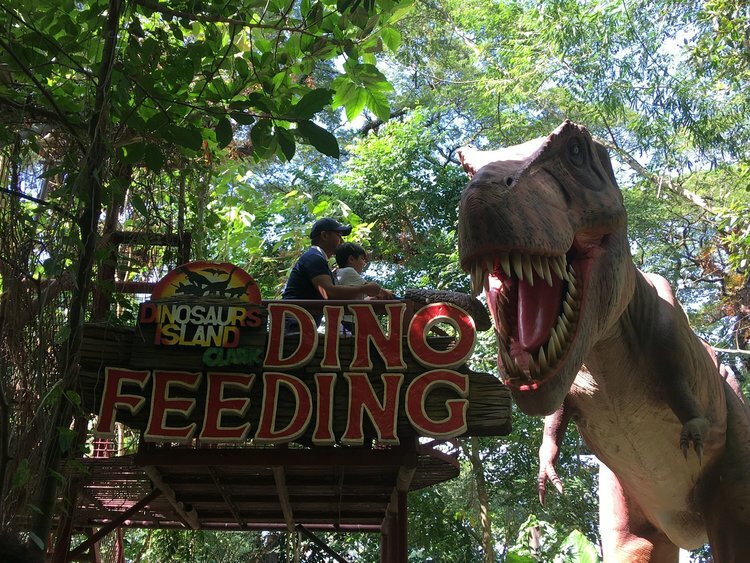 During your Dino Trail activity, you’ll pass by a huge T-Rex that you can “feed”. Of course, it’s not a real dino–but it’s a nice photo opportunity. My kids cried though! The dino is huge! Ride a Jurassic Park-like vehicle and experience being chased by dinosaurs. 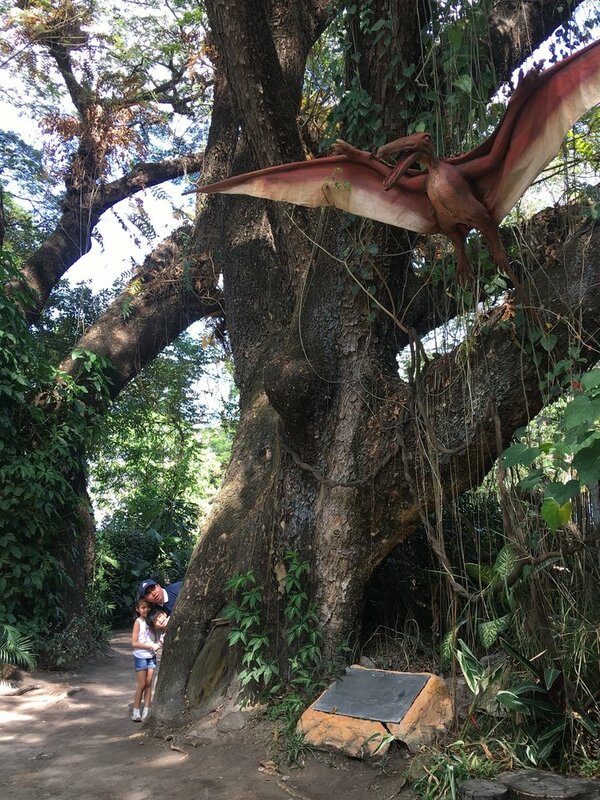 Put your glasses on and experience going on a Jurassic adventure! This is your chance to take lots of photos with the replicas of the Wonders of the World as your background! Learn more about the age of the dinosaurs as you view giant dinosaur fossils. This is just a dino with a seat on top that kids can ride. It just moves back and forth. Honestly, my daughter said it wasn’t worth it. LOL! Also inside the Clark Picnic Grounds is Insectlandia. 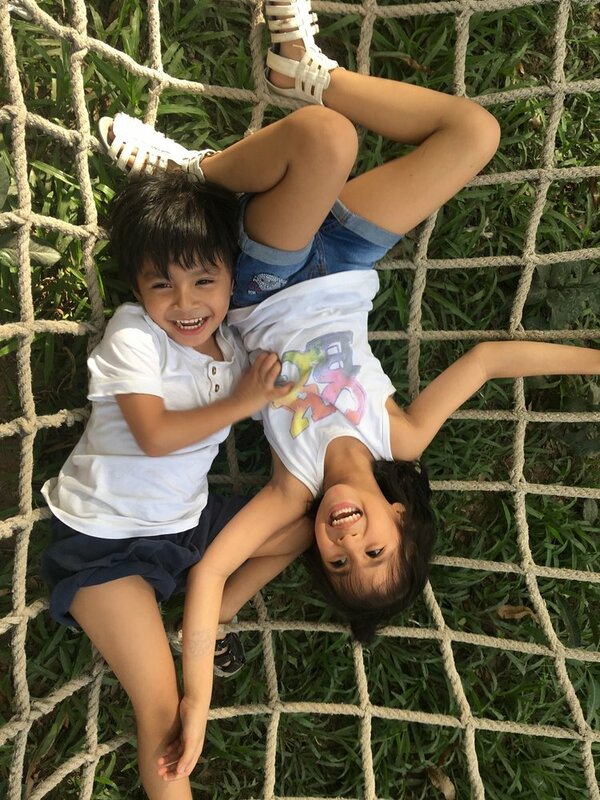 The rates are also at Php350 for adults and Php300 for kids. However, since we came late, we decided to skip Insectlandia and just went for a food trip in Angeles City. Our recommendation? Binulo Restaurant! Binulo serves authentic Kapampangan dishes with big enough servings for a family of four. My husband has been looking for Sinampalukang Manok just like it’s cooked at home and this restaurant gave him exactly that. It was my first time trying it and I liked it too! Bring water. Lots of it. Bring food! There are not a lot of concessionaires in Dinosaurs Island. We saw that other families brought food with them so we concluded that it’s allowed. There are huts available so you can just settle anywhere to eat. Bring extra clothes. Because you’ll get sweaty! Lather yourselves with insect repellent. Since there are a lot of trees, plants, and small ponds around, I noticed bugs flying around. So as not to be bit, wear a bug repellent. Take lots of pictures and videos. It’s going to be a fun trip with the family. There are a lot of attractions at the park. Go there early. There are a lot to do aside from exploring Dinosaurs Island. Inside the Clark Picnic Grounds is Insectlandia and a picnic/play area that your little one will most likely want to play in for an hour or two. From North Luzon Expressway (NLEX), take the Dau, Mabalacat Pampanga exit. Make a left turn going to Angeles City then right towards Clark. Look for the huge Clark Picnic Grounds sign. Dinosaurs Island Clark is inside the picnic grounds. To be safe though, you can use Waze to help you navigate. Parking spaces are available. Our trip from Rizal to Dinosaurs Island took around 2 hours and 25 minutes. From Manila, take a bus that will pass by Dau. Once in Dau, take a jeepney going to Mabalacat Market. From Mabalacat Market, take another jeepney going to Clark Freeport. Let the driver know to drop you off at Dinosaurs Island.